PAN India 3G service provider and India's most trusted telecom brand, Bharat Sanchar Nigam Limited (BSNL) has launched Special Tariff Vouchers (STVs), Prepaid Plan Vouchers and Postpaid Plans to offer all India Free Roaming to their GSM Mobile customers under Prepaid & Postpaid mobile services. 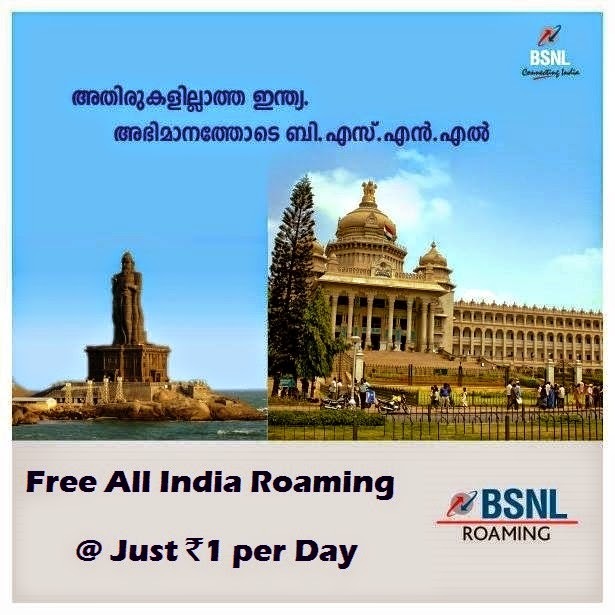 Now BSNL customers can enjoy unlimited free incoming calls while roaming anywhere in India including Delhi & Mumbai. This offer is available in all the telecom circles in India. Prepaid mobile customers can choose from the existing four types of All India National Free Roaming STVs. These STVs are : VOICE5 ( Validity:1 Day), VOICE33 ( Validity:7 Days), VOICE67 ( Validity:30 Days) and VOICE89 ( Validity:90 Days). These STVs are useful to those customers who don't want to switch their existing prepaid tariff plan, but wish to enjoy the free roaming feature. Free Roaming STV : VOICE89, with effective rate of Rs.1/- per day has already made an impact in Indian Telecom Industry. Customers who want longer validity Roaming Tariff can choose Prepaid / Postpaid National Roaming Free Tariff Plans with reduced tariff. RTP 46 is a prepaid plan voucher which offers a validity of 180 days with all roaming incoming calls at a reduced rate of 1.2Paise/Sec. It also allows customers to make all outgoing calls at 1.5Paise/Sec while in roaming and in home circle. RTP FR 199 is a prepaid plan voucher which offers a validity of 180 days with unlimited free incoming calls while in roaming. It also provides 2000Sec BSNL calls & 2000Sec other network calls for the first 30 days. These freebies are available in home circle and in all India roaming (including MTNL network). RTP 145 is a postpaid plan with Fixed Monthly Charge of Rs.145/-. It offers 100 Minutes free calls ( Local + STD) every month, with all outgoing calls ( Local + STD) and incoming calls in roaming at a reduced rate of 1.2Paise/Sec. RTP 149 is a postpaid plan with Fixed Monthly Charge of Rs.149/-. It offers unlimited free incoming calls in roaming with 100 Minutes free calls ( Local + STD) every month, with all outgoing calls ( Local + STD). All outgoing calls will be charged at Rs.1/- per Minute.